We have a new hi-resolution portable digital audio player here and it’s the new Opus#3 from The Bit. We reviewed their first DAP (digital audio player) the Opus#1 last year. The Opus#1 can be considered as a mid-fi or mid-range DAP, and it’s a very good sounding DAP with a clean and rich audio quality. Then they released the Opus#2, their flagship and top of the line DAP. Unfortunately we didn’t get a chance to review this one. Now we have here their new Opus#3, and this DAP is positioned in between the Opus#1 and Opus#3, don’t let the numbers confuse you. The new Opus#3 features a new stylish design, to which I find very attractive. It doesn’t feature a dual-DAC setup like its predecessors, but its audio section is powered by a Burr-Brown PCM1792A DAC chip. It supports both 24bit/192kHz PCM audio formats and DSD formats up to DSD256. The list of features doesn’t end here. Continue reading below and find out more about the new Opus#3 DAP. The Opus#3 digital audio player (DAP), or portable “Mastering Quality Sound audio player” – as the company would call it, sports an elegant design and set of features that we see on modern day DAPs. 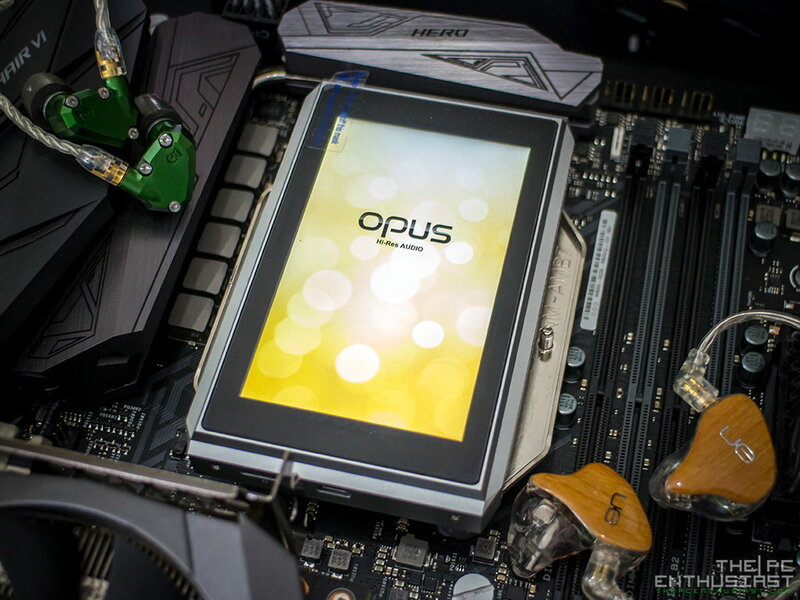 The Opus#3 is powered by an ARM Cortex-A9 quad core SoC clocked at 1.4GHz, paired with a 1GB of DDR3 memory. Meanwhile the audio section is powered by a Burr-Brown PCM1792A 24bit/192kHz DAC chip paired with an X-MOS chip. It supports both PCM audio formats and plays DSD up to DSD256 natively. Just a quick comparison, the Opus#1 features two Cirrus Logic CS4398 24bit/192kHz DAC chips; while the top of the line Opus#2 features two Cirrus Logic SABRE32 ES9018K2M 32bit/384kHz DAC chips. Both the Opus#1 and Opus#2 uses a dual DAC design while the Opus#3 uses only one Burr-Brown PCM1792A. However, don’t let the number of DAC chips confuse you. Despite having only one DAC chip, the Opus#3 is still better compared to the Opus#1 (in several ways) and there are many music lover and audiophiles who prefer the sound that a Burr-Brown DAC produces. Moving on, the Opus#3 has a 4-inch IPS touch display with a resolution of 400×800; nothing special since the #1 and #2 also features the same display type and size. It has 64GB of internal memory, and there’s an optional 128GB memory; but it has only one microSD card slot that supports up to 256GB of microSD SDXC in exFAT or NTFS format. In terms of connectivity and output options, the Opus#3 has a microUSB port for charging and data transfer. It also has WiFi and Bluetooth 4.0 for wireless connections, DLNA and audio streaming. As for output options, it has a 3.5mm single ended output port that also serves as an optical out, and a 2.5mm balanced output supporting 4-pole plugs. The 3.5mm unbalanced output has a 2ohm impedance and is capable of delivering 2.5Vrms. While the 2.5mm balanced output has 1ohm impedance and can deliver 3.0Vrms output level. I’ll discuss more about its physical design and features on the next page. Meanwhile you can check out more information about the Opus#3 on the specifications table below.